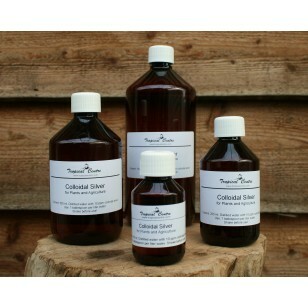 Our colloidal silver contains 99,99% pure silver particles in distilled water. The purest form available to treat viruses, bacteria or any other single celled germs. It disables the oxygen-metabolism enzyme, and within minutes the virus and bacteria suffocates and dies. Unlike pesticides and chemical fertilizers, colloidal silver leaves the beneficial enzymes intact. Colloidal Silver is a tasteless, odourless, non-toxic, pure, natural substance consisting of sub-microscopic clusters of silver particles, suspended by a tiny electric charge placed on each particle, within a suitable liquid. Adding colloidal silver to cut plants allows the plant to live longer and prevents if for bacteria, viruses and fungi that might be in the water. Spraying a small amount of colloidal silver onto the stem and leaf surfaces, allows the plant to absorb silver ions and prevent fungi, viruses and bacteria from colonizing the outer surface. The colloidal silver is absorbed into the plant and as a result, kills any pathogens inside itself as well as any embedded insect eggs. However, colloidal silver does not affect mature insects, therefore pollinators such as bees and ladybugs are not harmed. Garden food plants that have been sprayed with colloidal silver leave no residue, as do poison sprays, and are safe for human consumption. It can be sprayed on the plant or added to the water. A few tablespoons per litre water will do.